Enjoy 18 acres surrounding a 6 acre lake. 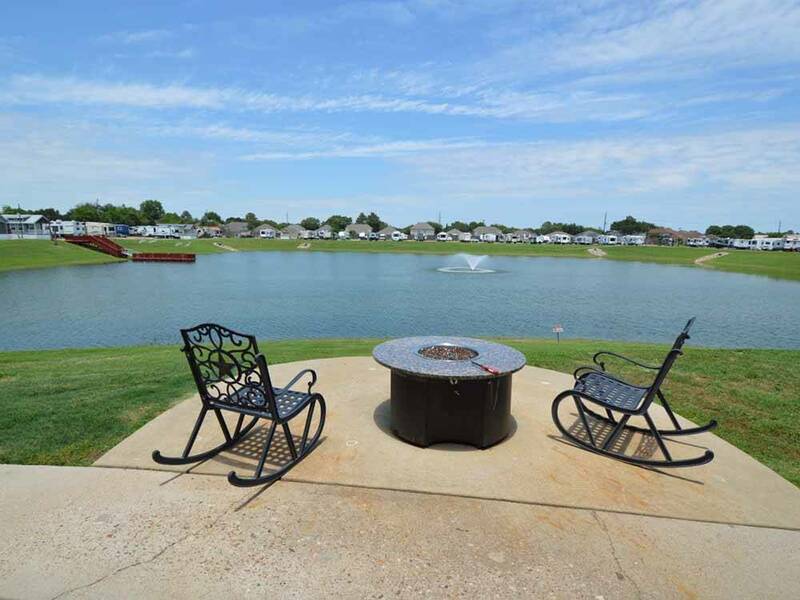 Come enjoy the peaceful, easy, laid back lake life atmosphere. Located within 10 min. of a wide variety of restaurants, shopping and medical services. Tucked back among residential neighborhoods this park has surprisingly good facilities. We loved Katy Lake Rv Resort! We had a lakefront spot with a great view. Plenty of room for not only our 40' MH but our Tahoe as well. Even parking for friends. The park was not crowded when we were there. There are some full timers there and there are some displaced by Harvey but nothing negative about any of them. They were all very welcoming! The clubhouse was very nice with a large sofa, pool table, water and ice, a treadmill and elliptical. Awesome outdoor grills for your use right next to the fantastic heated pool and hot tub. Met a LOT a very nice people in that pool! We were in 513 which to us was a great spot very close to the clubhouse. The lake is a wonderful place to walk the dogs. I enjoyed watching the turtles bask in the sun. Never got to fish but thats ok as there is about every grocery store within a couple mile radius so I let them fish and hunt for us. Uber and Lyft are a very easy way to get around as well. If you have to be in the Houston area, this is a wonderful park. The park was a little hard to find on the way in, due to it being set way in the back off the main road. The park is gated, which is nice. The hot tub and pool area is excellent! The layout of the park is nice but it lends itself to a couple of issues. If you are on the side of the lake or in the back of the park, the only dog walk/run is all the way in the front. Another one would be a welcome addition. Noise in the early morning can be a little loud. Lots of people are here working in the area. The clubhouse is very nice, large sofa and TV. A small workout area but free coffee in the morning and sometimes donuts. The biggest disappointment with the park is the WIFI/Internet access. Depending on where you are in the park, the reliability is not good. Additionally, this is the first park where I have been informed that I am limited to how much WIFI I can use on a monthly basis. The management will also actively block devices that do not meet their rules for internet utilization. I draw the line when it comes to this. It's a little over the top in my opinion. If the park needs to go to this extreme, it needs an upgrade or it needs to find a way that a service provider can get service to each site. Overall, we would stay here for one night, if passing thru, but no longer than that until a few items are changed. KLRV is a well kept secure resort. The spaces are a good size even with a dually truck and 38' 5th wheel. The club house has an ice machine with Sonic style ice which I love?? The staff is friendly and accommodating. We stay there when in Houston area visiting family. Highly recommend. This is a nice park, with a good location close to Katy shopping, restaurants and entertainment. The facility is gated and well off the road, so it is secluded and quiet, despite being well inside Katy city limits. The game room and pool and hot tub area are excellent and there is a nice concrete walkway around the lake perfect for nice walks. The management is generally attentive, although they attempted to put us on a short site even through we paid for the longer site. When we complained, they moved us, but it appeared they were trying to short us for what we have properly paid for. The water pressure and hook ups were good. Wifi was inconsistent and often did not work. This is a very nice, quiet, clean, facility. This is a gated park which is nice. The park is big rig friendly with level concrete sites. Utilities worked well. Wi-Fi was good. Roads are paved and easy to navigate. The staff was extremely friendly and welcoming. There is no shade. Very close to shopping and food. We would definitely stay again. We stayed here this week and it has been the worst place I have ever stayed. Yes the place is beautiful but the staff here are some of the rudest people I have ever come across and my family and I travel with my husband for work so we go all over the United states. They didn't always allow kids and now they do and they should of kept it the other way bc if your kid even walks out of the rv then they have to be accompanied by an adult. They are not allowed to go anywhere without you. I get going to the pool but to the dog walk really. Yet if your dog poops they sure are quick to charge your card that they keep on file. They have all these stupid rules yet we don't even have enough power to our rv to have everything running. We have to turn stuff off to turn other things on. They sure do make it look pretty but don't expect to enjoy yourself. Will never stay here again. Being from Michigan, this is the perfect place for us to spend some of the winter time as we have family nearby. We stayed almost 3 months, Jan-Mar. We like the larger sites for the bit extra $. The clubhouse and restroom are very nice and clean. Exercise area, TV, pool table, coffee area. Wonderful outdoor, covered, bbq area for entertaining, and a terrific pool with spa. Laundry is small--could use more single-load washers, and the ice machine is incredibly noisy. The grounds are neat and tidy, although there aren't any trees or shrubs as yet. Very pet friendly. The layout is such that we were sheltered from all the outside traffic, while still having all the conveniences of stores and restaurants nearby. Only negative is the Fry Outside Storage that holds lots of big rigs and semis making for lots of noise and dirt/dust at times in the southwest corner of the resort. All the staff are diligent and attentive and very pleasant! Security is excellent with a locking gate requiring passkey to get in. Major repair work was being finished up on the east side of the resort while we were there, but was just able to park RVs about the time we were leaving. Mostly for adults, but the resort is now taking families with pre-school children. 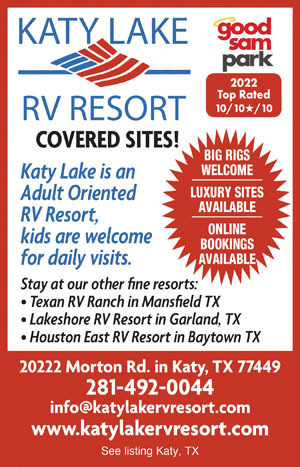 As they continue working on improvements, Katy Lake RV Resort will be a nicer and nicer place to stay, and we'll be back! Only here for 1 night but clean, quiet. Has security gate but no dog park. Good experience. The club house and showers are lovely.The handicap shower in the women's side was out of order our entire stay; we were there a month. There are no activities of any sort. Many of the long term residents are employed and go home for Holidays. There was no "grass roots' potluck planning or coffee & cookies. The park is fairly quiet. The management will pick up, fill, & deliver back your propane tanks, nice service. They charge your credit card. They will accept your mail in the office,The park also brings a small table and two chairs to your site after you check in, there is no picnic table at your site when you arrive. Stayed all over the country in the past year and this is our number one best park. Cement sites, showers are huge, locked gate for security, free ice machines, clubhouse and pool are beautiful. Really is a resort, love staying here. Come and check it out, you will love staying here.